A few weeks ago as I was interviewing Andrew Pudewa on our weekly Facebook live broadcast, SPED Homeschool Conversations, I made a comment about the process I used to successfully teach my own son how to write using IEW’s (The Institute for Excellence in Writing) program. Slow and steady was my response. You can watch that interview here on our Facebook page, watch the long videos or shorter videos taken from that interview on our YouTube channel, or listen to the podcast at this link. 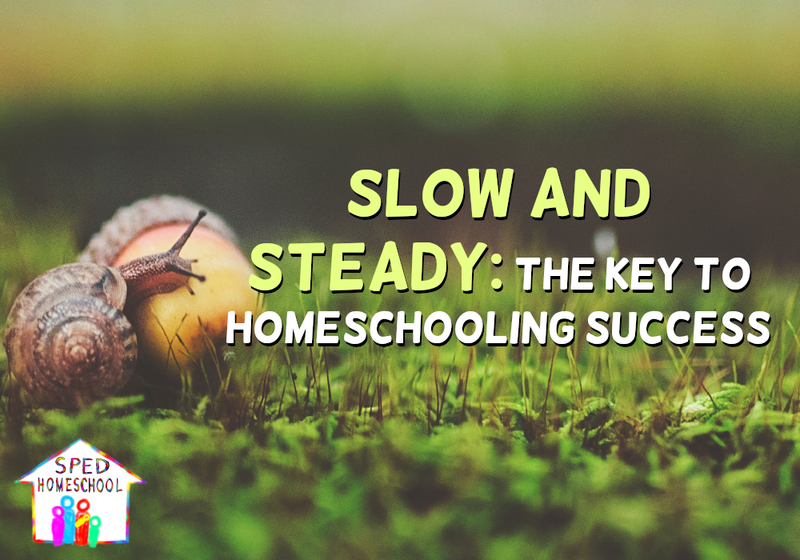 In this article, I wanted to expand upon my answer and explain not only how to homeschool slow and steady and how it led to educational successes for my own children, as well a how it can lead to success in your own homeschool. Too often I speak to parents who are extremely anxious about getting their child caught up with a typical learning or developmental timeline. There is so much pressure in the educational community, including homeschooling circles, to press children towards measurable success. Unfortunately, this pressure can have parents focused on college readiness while their kindergartner is still learning numbers and letters. Having now homeschooled for over 16 years and graduated 2 struggling learners I find myself looking back and realizing how much of this pressure I allowed to side-track our homeschooling. If I were to be honest, my “progress panic attacks” caused as many problems as my children’s learning issues and defiant outbursts. In hindsight, I realized when I let external pressure take control of my teaching, I was least effective in homeschooling. On the other hand, when I kept my nose down and stopped looking at what we weren’t doing and how far we were away from where I wanted my children to be, progress was evident. Now, I have to admit I didn’t always see a measurable product of my efforts when homeschooling slow and steady. We just kept moving forward at a steady pace gauged to match the speed each child was learning. Many days it seemed like we were just going through the motions, repeating things WAY too much, and moving so slowly that no progress was happening. But, that is the essence of teaching slow and steady; it grasps being in the moment and teaching what needs teaching now, not tomorrow. Make a learning plan not constrained by dates. Instead, focus on learning goals and steps that progress towards those goals. Many parents find it helpful to write a homeschool IEP for their student with regular assessment intervals – monthly or quarterly is best for measuring notable progress. This may sound simple, but sticking to the plan is one of the most difficult steps if you are like me and panic gets you off track. One day at a time, nose down, and determined to not get off track is the way to stay consistent. Moving too fast actually makes learning take longer. Progress takes time and moving at the pace of your student will ensure your child is absorbing the lessons you are taking the time to teach and integrating those lessons into their long-term memory for better recall when those facts need to be used for more complex processes. If frustration sets in, take a step back to re-evaluate. Don’t blame yourself or your child, these breaks are natural. Sometimes you will need to switch tracks on how you are teaching a subject if your student has a learning block. Other times you both need some time away from that subject altogether. If neither of those methods works, then it may indicate you need to seek out help from a professional. But stepping back is essential in determining which course of action is the best for your situation. No matter what learning pattern is set by other children in your household, your friends’ children, or any “normal” developmental timeline, your child is unique; and therefore, your child’s progress will be unique. This is true whether or not a child has been diagnosed with a learning disability. All children learn in spurts and stall out at times, this is natural. By not comparing one child to another, you allow your child to learn and grow at the pace that best suits your child’s level of learning progression. In that same conversation I was having with Andrew Pudewa, I confessed we used his curriculum with my oldest son, but this same son never wrote a paper for me in the entirety of his homeschooling career. Each day we did the writing lesson, went through the steps, learned the process, and slowly and steadily I taught him the mechanics of good writing. After graduating high school this same son would text and email me while he was away studying at welding school, but he still never wrote a paper. Then, when he started college just after turning 18 he started writing beautiful papers and getting A’s in his college English classes. That was when it became evident to me that he had learned the process of writing because I had taught him slowly and steadily using a system that worked. It just took him time to use what he had learned and produce a product that showed the process had worked. I pray as you look to the new year and set goals for your teaching and homeschooling, as well as for the individual progress for each of your children, that you will conquer any anxiety or fear you may have about the future by following the steps I have outlined above. 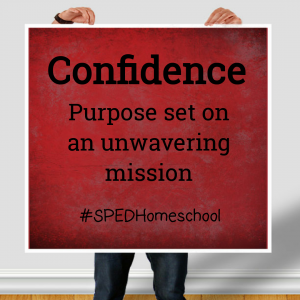 Do you know SPED Homeschool is 100% donor funded?